Grant Green's tenure in Anaheim is likely over. 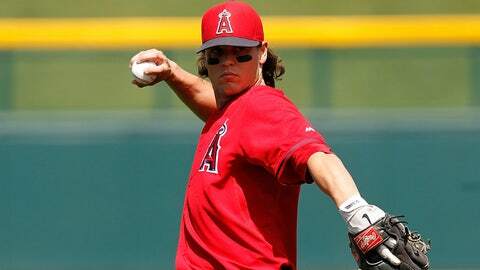 The Los Angeles Angels had to make a roster move on Wednesday to facilitate the addition of pitcher Jo-Jo Reyes, and infielder Grant Green was the odd man out. Green was designated for assignment to free up space on the 40-man roster for Reyes, likely bringing an end to his short tenure in Anaheim. Acquired from the Oakland Athletics in the 2013 trade that sent Alberto Callaspo to Oakland, Green hit .263./299/.353 with the Halos in a handful of stints with the Halos from 2013-2015 mostly as a utility player all around the infield and in left. Green, 28, was drafted by the A’s ahead of Mike Trout in 2009 (in an example of how tough it can be to figure out how best to use a Draft pick). Fletcher notes that the Angels will likely release Green once he clears waivers, and he’ll most likely catch on with another club after that.